How could i calculate the voltage induced in a detector circuit by picking up RF signals from a Mobile phone? Is there any formula/equation i could use to estimate the voltage induced at the input from the RF signals? This circuit depends on the MOSFETS, in the first differential pair of the CA3130, acting as rectifiers albeit not very good rectifiers, because the fundamental MOSFET bandwidth depends upon channel-spacing from source-to-drain but the rectification depends upon the junctions of the MOSFET, such as the source-bulk isolation-junctions and not on the channel-spacing. And the part number ---CA3130--- is a part number from the 1970s (thus 40+ years ago). To presume the same process is used today is not a good presumption. Summary ---- you are asking about the UHF (30-300MHz) and SHF (300 to 3,000MHz) rectification efficiency of isolation-diodes of unknown doping profile and of unknown biasing condition (both voltage and idling currents). Not the answer you're looking for? 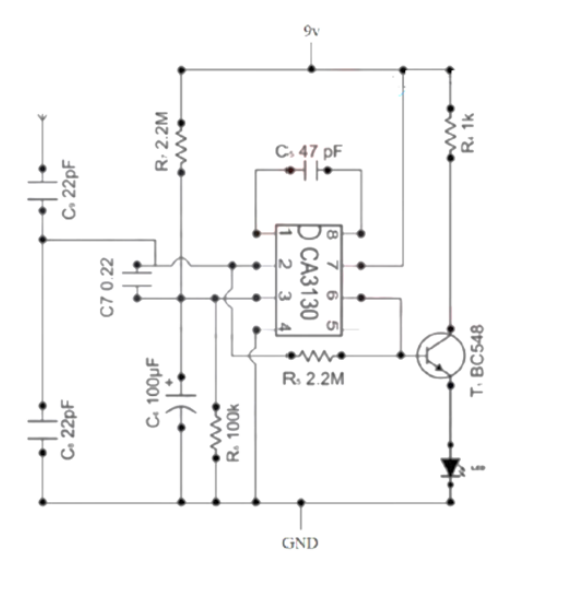 Browse other questions tagged rf bjt power-electronics or ask your own question. How to filter RF signals to get the average value? How is the output voltage of a mobile phone charger fixed to a rated value? How to create constant 5V 300mA from 0…6V variable voltage source (voltage generator)? What will be the range of this mobile jammer circuit? In op-amp, how do they remove Quiescent votage (bias voltage of a bjt) from the output?